When many think of African fabrics, the first thing that comes to mind is wax prints: the brightly colored, geometric, symbolic designs on fabric sported by Africans and those living inside (and more and more outside) of Africa. A recent article on the history of “African” wax prints reveals its complicated beginnings (which aren’t really African, by the way). The article describes how today’s African wax prints were actually developed by Indonesian invention, Indian influence and Dutch manufacturing. What’s more, one the biggest and perhaps most well-known and respected manufacturers of African wax prints isn’t even African — it’s Vlisco, a Dutch company. 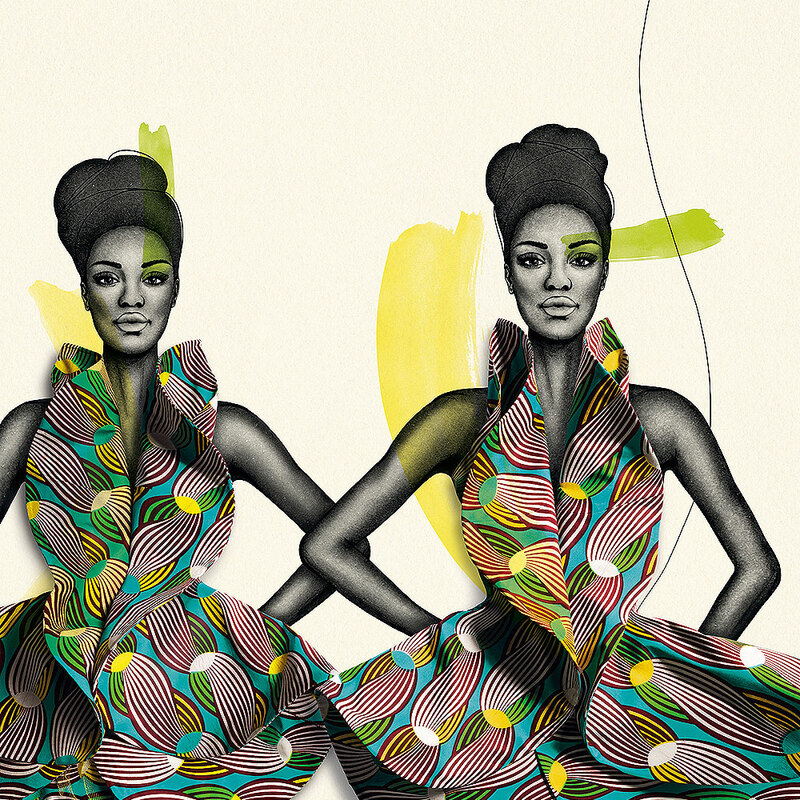 It’s an incredibly interesting (and informative) story, but I think it misses out on the bigger picture: What does it mean when non-African companies like Vlisco are the major purveyors and trendsetters for “African” fabrics? And what does this mean for opportunities for a local (or, at least regional) industry to meet local demand — in this case, a local textile industry? Now don’t get me wrong, Vlisco’s prints are gorgeous, they’re beautiful. This company is very, very good at what it does. But as someone interested in urban and community development, I can’t help but wonder about the long-range impacts for any local, African-based textile industry — and in how this incorporates how we define ourselves through “African” print. While its beginnings may be non-African, African/traditional/”local” cloth has become a part of everyday life. Some people wear it everyday, while others bring out their best outfits for “traditional Fridays” (an African take on “casual Fridays”), Sunday church, and for special events like weddings and funerals. You can buy it in ready-to-wear forms, but most often, people buy it by the yard and take it to tailors or fashion designers to have an outfit created. And when we talk about African cloth, there are various forms – the article I linked to focused on wax prints, but there are also traditionally, really local and indigenous cloths (ex: kente) that shouldn’t be overlooked. Local demand for African wax print is huge. And with that kind of demand, it would make the most sense to focus on local production: It would be fantastic for the local economy (by providing jobs), it could be linked to rural production and economic opportunity by sourcing locally grown raw materials, and it could even bring in foreign revenues through export. But that’s been easier said than done. Back in the 1960s, there was a pretty sizeable local textile industry with a number of local companies producing and exporting abroad. According to a 2006 article on the textile and clothing industry in Ghana, in 1977, textile manufacturing employed some 25,000 workers (27 percent of all manufacturing employment) in Ghana (mostly in Tema and Accra). But in recent decades, this industry has been in serious decline. Almost 20 years later (1995), those figures had receded to just 7,000 workers. By the year 2000, it had reduced further to 5,000 workers. To make this point clearer, consider that in the 1970s, there were 16 medium to large-sized textile manufacturers based here in Ghana, providing massive urban employment. 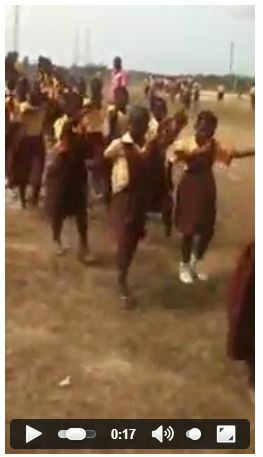 Ten years ago, there were only four, located in Tema. So how did this happen? After independence, many African countries aimed to develop their own products, instead of importing them. The emphasis was on reducing foreign reliance. In the 1980s and 1990s, the decline in the textile (and other local industries) suffered when the country went from an import-substitution policy (“let’s make our own products instead of importing stuff”) to trade liberalization (“ok, ok, let’s open up our doors to international trade”), which was linked to structural adjustment policies. This was a trend throughout the continent. In addition to government policies such as that one, the country’s declining textile industry has been linked to to poor production quality and sub-standard Chinese products that flood the market. From 2009-2010, I worked with a group of consultants on multi-sector economic research to identify viable investment opportunities for the city of Kaduna, Nigeria. We wanted to understand how foreign investment could boost the local economy by supporting local industries and capitalizing on existing rural-urban linkages. One opportunity that came up was for foreign investment to help revive Kaduna’s local textile industry — but it wasn’t a viable one. Perhaps raw materials could be sourced locally, but machinery was old, it usually wasn’t maintained well, and it had to be imported. In addition, government policies made it too difficult to start and run businesses, or provided little support or incentives. Finally, low-cost, low-quality “copycat” designs from China have literally flooded the market, and there is little way for local producers to compete, even though their products would at least be better quality. A big issue was also shifting consumer tastes. In both Ghana and Nigeria, you have a growing middle class (translation: people with more disposable incomes) who have more and more money to buy luxury products; however there is also a trending preference for foreign-made over locally-made items. Whether or not it’s accurate, many people seem to identify foreign-made products as higher quality than locally made ones. Shifting consumer tastes seems to be a major trend. Possession of foreign-produced produces is a sign of class, it’s a sign of the money. But in the end, it’s really bad for the local economy when people choose to patronize foreign-owned companies rather than local producers. Vlisco advertisement for it’s Dutch-made “African” wax cloths. A quick aside: An interesting thing about Vlisco is not only has it been around for nearly two centuries, but it’s also part of a huge conglomerate that has a major hold on the West African market. Vlisco already owned GTP and Woodin; in 2010, Vlisco was acquired by Actis, an emerging market investment firm with a porfolio of investments including energy, real estate, financial services and industrial development, including its investments in Accra Mall and the One Airport City development (also in Accra). The Ghanaian textile and garment traders, who are the most affected victims of [the declining local textile industry], are currently recording financial losses as a result of the floodgate of substandard Chinese fabrics into the country’s market. 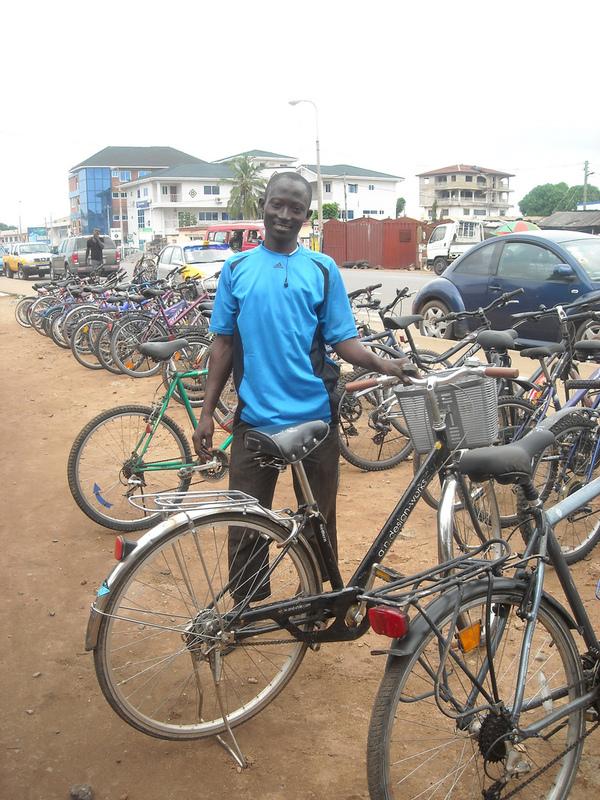 This was revealed by some of the traders interviewed…in Makola Market, Accra. Madam Comfort Aacas, a trader, said that Chinese imitation of the local fabrics is really causing them huge financial loss. 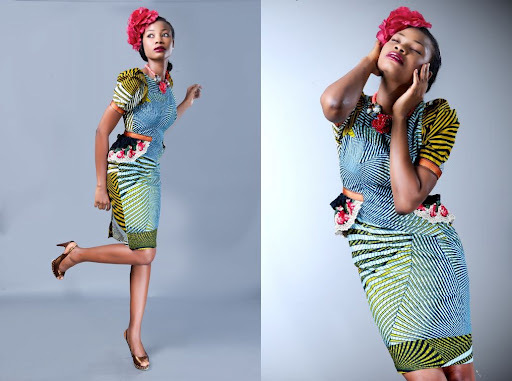 “I spent a lot of money to engage the services of artists to design my fabric. I also paid the textile factory the roller fee to print my fabrics all in the interest of my customers. But surprisingly, the same fabric I paid for its design and printing, end up being imitated and mass- produced by the Chinese,” the trader said. “How could a Chinese print a design in my local language? 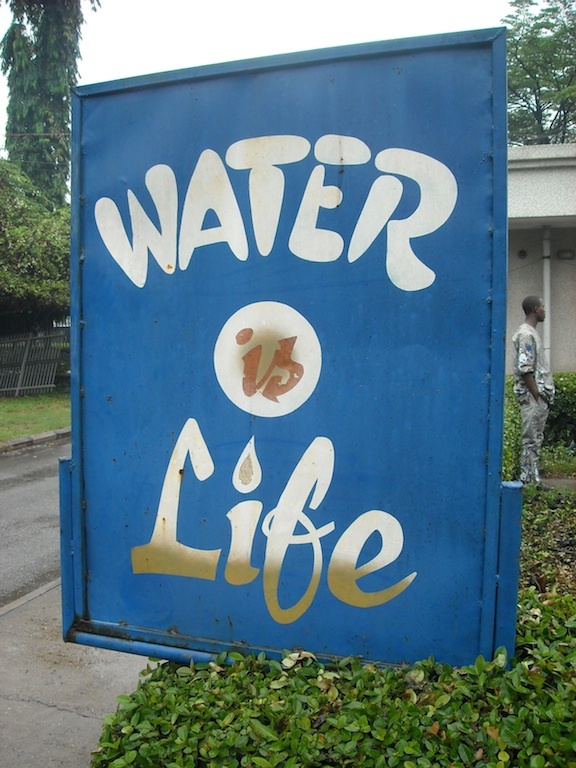 This is fraudulent and is causing us serious financial loss,” Aacas said. This development, according to her, is also a boost to the unemployment rate in the country. 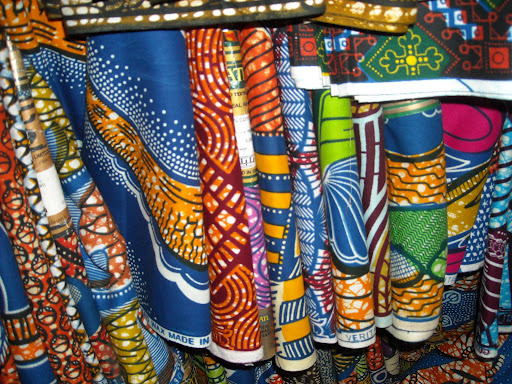 West Africans often consider the Chinese imitation wax cloth down-market and inferior to the European standard; the Chinese cloth, crucially, is frequently printed only on one side. But for those who have been priced out of the Vlisco market, the Chinese offer a welcome alternative. Am I going too deep on this? Again, Vlisco produces some great stuff, but I can’t help but be worried by the overall trend that seems to be happening right now. Your thoughts are welcome and appreciated.